Chart Wealth... Russell 2000 Soars Above Broad Market Indices! March 2006, Volume 3 Issue 3 Know It - Profit! Get Your iShare Of The Profits!" The Russell 2000 shows no signs of letting-up. Is now the time to take advantage of an exchange traded fund (ETF)? Also... gold, oil and steel continue to be strong players. Look for outstanding trades in these markets. The Russell 2000 (^RUT) continues to make solid gains... up 8.25% year-to-date.. The Nasdaq Composite (^IXIC), Dow Jones Industrials (^DJI), Standard & Poor's 500 (^GSPC) and Wilshire 5000 have barely eked-out a 2% gain year-to-date. Your money market account never looked so good! Where is the S&P 500 going next? This month, the AMEX Gold Bugs Index (^HUI) is shining... up 11.7% year-to-date. The PHLX SIG Steel Producers Index (^STQ) continues to prove its mettle... up an impressive 22.8% year-to-date. PHLX Oil Service Sector (^OSX), AMEX Disk Drive Index (^DDX) and PHLX Semiconductor Capital Equipment Index (^SEZ) are making steady progress with 5.7%, 11.4% and 19.3% gains, respectively. Will these leaders continue their steady growth? Or, are they due for that inevitable correction? When a broad market index consistently out-performs like the Russell 2000 has, consider trading its ETF. On the weekly chart, IWM is trading well above its moving average channel... signaling a strong trending market with more room to grow. Also, the Commodity Channel Index (CCI) reflects the strength of the move by remaining solidly above the zero line. However, a minor divergence may be forecasting the beginning of a corrective pause. 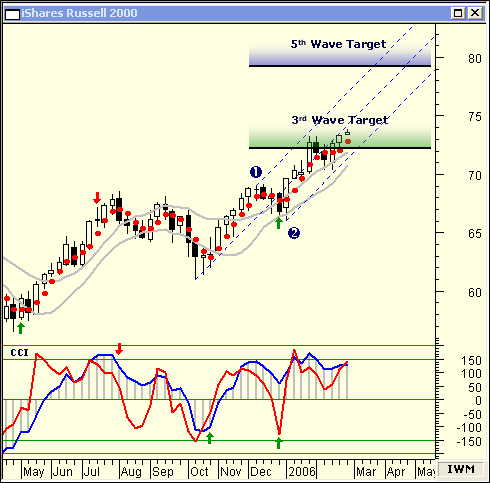 Recently, IWM reached a Wave 3 target area. After some consolidation, expect a run up to the Wave 5 target area of $79 to $82. The ETF is a great way to take advantage of a strong market or sector. And... always, diversify your portfolio -- reducing risk to a manageable level.